Skinceuticals made skincare history when it launched CE Ferulic, the first CEF Serum. That’s Vitamin C + Vitamin E + ferulic acid, one of the most powerful antioxidant combos you can get your hands on. And, for a while, you could only get your hands on it by forking out $160+ on Skinceuticals. The “rascals” had patented it! But now the patent’s expired, every skincare brand worth its salt is coming out with a dupe. One of the cheapest is Timeless 20% Vitamin C + Ferulic Acid Serum. Should you make the switch? L-Ascorbic Acid is the pure form of vitamin C. It’s the most effective. And the most irritating. L-Ascorbic Acid is highly unstable: it degrades, and becomes ineffective, in a few short months. Use your bottles quickly! (P.S. You’ll know when it become useless: its turns brown). L-Ascorbic Acid can cause irritations: the higher the dose, the higher the risk (and the benefits). Especially if you have sensitive skin. The concentration of L-Ascorbic Acid is the deal-breaker here. Skinceuticals has 15% while Timeless 20%. If your skin’s sensitive or you simply never used vitamin C before, go with Skinceuticals (or a dupe that has 15% L-Ascorbic Acid too, like Paula’s Choice C15 Booster). This is vitamin E. It’s a powerful antioxidant that doubles up as moisturizer (it strengthens the skin’s natural barrier and reduces water loss). Vitamin E works wonders on its own. But it’s when paired with Vitamin C that it really shines. The two are network antioxidants, a fancy way of saying they boost each other’s effectiveness. Not only this combo helps you fight premature wrinkles better together but it also has photoprotective properties that can help prevent sun damage (the main cause of premature wrinkles). Related: What Does Vitamin E Do For Skin? Ferulic Acid is an antioxidant on steroids. Most antioxidants only destroy one type of free radical. Ferulic acid destroys three: superoxide, hydroxyl radical, and nitric oxide. To make the most of it, use it with its best buddies, vitamins C & E.
A 2005 study shows that “its incorporation into a topical solution of 15%l-ascorbic acid and 1%alpha-tocopherol improved chemical stability of the vitamins (C+E) and doubled photoprotection. […] This combination of pure natural low molecular weight antioxidants provides meaningful synergistic protection against oxidative stress in skin and should be useful for protection against photoaging”. Translation: 15% vitamin C + 1% vitamin E + 1% ferulic acid fights free radicals, prevents sun damage and makes the antioxidants last (and be effective) for longer. FYI, if you’re allergic to grains such as wheat, corn, or barley, consult your doctor before using products with ferulic acid. Both Skinceuticals CE Ferulic and Timeless 20% Vitamin C + E Ferulic Acid Serum keep their formulas pretty simple. Antioxidants aside, they both have sodium hyaluronate to hydrate skin. Sodium hyaluronate is moisture magnet: it attracts water from the air and drops it into the skin. It’s so powerful, it can hold up to 1000 times its weight in water and works well both in high and low humidity conditions. Skinceuticals CE Ferulic goes a step further: it also glycerin, another moisture magnet. It does the same thing as sodium hyaluronate but on a smaller scale. What that means? If you’ve got dry skin, you’ll probably like Skinceuticals a little bit more. 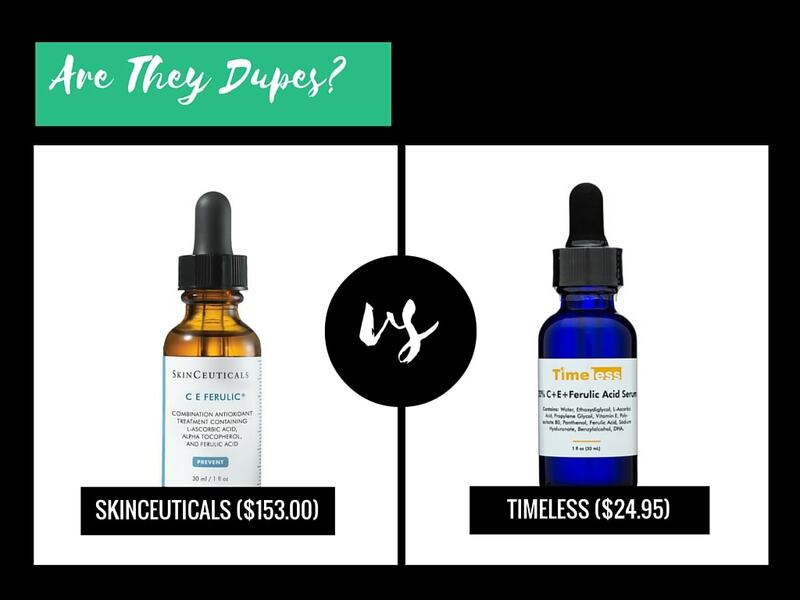 So, Is Timeless 20% Vitamin C + Ferulic Acid Serum A Dupe For Skinceuticals CE Ferulic? Yes, Timeless 20% Vitamin C + E Ferulic Acid Serum is a great dupe for Skinceuticals CE Ferulic. It’s even a little more powerful (and slightly more irritating). Unless you have sensitive skin, you can switch safely. Have you tried these serums? Share your experience in the comments below. Timeless 20% Vitamin C + E Ferulic Acid Serum Ingredients: Water, Ethoxydiglycol, L-Ascorbic Acid, Propylene Glycol, Alpha Tocopherol, Polysorbate 80, Panthenol, Ferulic Acid, Sodium Hyaluronate, Benzylalcohol, Dehydroacetic Acid, Fragrance. I tried SkinCeuticals awhile back — I didn’t like the smell so much, but now that I’ve tried other serums, this seems to be the case with anything else that’s comparable. So I’ve just gotten used to it. Are the products sold on Amazon legit, then? Sometimes you read reviews from people claiming that it’s not the real formula, which is why the price is lower. I’d like to buy from Amazon for the savings, but I’m afraid I wouldn’t be getting the real thing. Laurie, I think the smell is due to one or more of the active ingredients as the Skinceuticals serum doesn’t have a fragrance. Timeless does, so maybe it’ll smell a bit better? I never thought of that. I don’t really pay much attentions to review on Amazon cos I don’t find them helpful most of the time. I guess the best thing would be to contact Skinceuticals and ask if the seller on Amazon is a legit retailer? That’s a good idea. If I’m going to pay that much, it should at least be the real thing! I buy my Timeless serum directly from their website. Timelessha.com. You can also contact Timeless to see if Amazon is an approved supplier. Helena, 🙁 . Maybe there’s a cheaper alternative that’s suitable for sensitive skin too? But at least Skinceuticals is a great product. It’s expensive, but it delivers. I have tried the Skinceuticals CE Ferulic and found that it has a really unpleasant scent so I just didn’t use it. In fact, I just dumped it in favor of the Vital C Serum from the Body Deli. Monica, what a shame! I appreciate that Skinceuticals didn’t add a synthetic fragrance to the serum, but if its ingredients don’t smell it good, it can put off a lot of customers. I’m glad you found an alternative that works well for you. I remember smelling a serum that had ferulic acid in it, and the scent was so horrible. It smelled like burnt plastic. It’s hard to get passed that scent. I guess applying a moisturizer after can help cover the smell. I have a very keen and sensitive sense of smell and do not notice any unpleasant smell when I use c e feurulic. I don’t understand what all the fuss is about. Betty, scents are very personal things, I guess. Glad it’s not bothering you, though. The unpleasant scent that some commenters are referring to comes from the way that vitamin C is combined with ferulic acid according to one of the chemists who own one of the million brands of vitamin C serum I have reviewed. In order to get rid of the scent, they are changing the way or the order in which the ingredients are combined to mitigate the scent and they are adding sweet orange oil. Thanks for the comprehensive information on these products. Would you recommend to use these during the day or as a treatment at night? Rachel, you’re welcome. I think it’s best to use them during the day because they can enhance the effectiveness of sunscreen. But there’s nothing wrong with using them at night, if you prefer that. I have been using SkinCeuticals C E ferulic for several years and I purchase it from Amazon. My problem is that it drys out my skin, I work outside and I am very fair skinned so I do use an SP but being winter I lay off the sp as it irritates my skin as well and I am looking for a moisturizing skin cream that has some anti aging capabilities without the skin irritation. Even Kiehl’s irritates any suggestions anyone? Thanks for the help. Organic Herbal Infusion, Organic Aloe Barbadensis Leaf (Aloe), Sodium Ascorbyl Phosphate (Vitamin C), ethylsulfonylmethane (MSM), Cassia Angustifolia Seed Polysaccharide (botanical hyaluronic acid), Hamamelis Virginiana (Witch Hazel), Carbomer, (2s)-2-Amino-5-guanidinopentanoic Acid, Kosher Vegetable Glycerin, Organic Simmondsia Chinensis (Jojoba Oil) Phenoxyethanol, Ethyl Hexyl Glycerin. I’m about to purchase my second bottle of timeless C until I came across this Poppy Austin web site listing their vitamin c serum . Teresa, it seems ok to me. I’m not a big fan of witch hazel because it can be irritating, especially to sensitive skin, but there doesn’t seem to be much of it in here so it shouldn’t cause problems.I also would like to know what the organic herbal infusion is. I’m sure it’s nothing bad, but without knowing what it is made up of, it is difficult to say about beneficial it is. Although this is not a bad serum, I’d still go with the Timeless one. That’s because the Timeless serum contains vitamin c, vitamin e, and ferulic acid, which is much more beneficial than using vitamin c alone with a bunch of natural ingredients. When I received the product it was nice and clear. It had a nice feel to it and felt good on my skin. After a few weeks it oxidizes, going from yellow then to brown. I know that oxidizing leaves the product ineffective. I emailed the company at least two times with no reply at all. I left a review on their site but they didn’t print it. I notice they have a 5 star rating. There are almost all fives with a few fours. If they don’t print all reviews, I believe this is false advertisement. It would have been nice to at least receive a reply. Jen, that’s appalling! That is false advertisement, and they should reply to customers. It’s things like this that makes you lose trust in a brand and take your money elsewhere. Unfortunately, it is normal for products with antioxidants to oxidize, but it shouldn’t happen so soon. Not if they are properly formulated, packaged, and stocked. Maybe you got an old bottle? It’s not clear which product you purchased. Can you clarify? This Guy, I didn’t purchase one.I just compared them, based on their ingredients and what scientific studies say about them. I hope this will help you decide whether your skin is sensitive enough to warrant the purchase of the Skinceuticals serum or if a cheaper alternative would do as well.If I did, I’d go with the Timeless one. It provides the same benefits at a fraction of the cost. What about pH levels for Timeless formula? I read on the Beautypedia site that the Skinceuticals formula is a pH level 3, which is ideal ascorbic acid to work. Do we know the pH level of the Timeless serum? I’ve just noticed that my bottle of Timeless serum doesn’t list fragrance as an ingredient. The last ingredient in the list is DHA. Perhaps they’ve improved the formulation by leaving out the fragrance? Vanessa, yes, I think they’ve reformulated it. But all the goodies are still there. So rare to come across a brand that changes its formula for the better, isn’t it? I asked Timeless’s pH and its 2.4. Also if I’ve ever had any issue they’ve responded quickly and appropriately. Never have had an issue with Timeless’s customer service. Susan, thanks for sharing. 2.2 is a bit low, but you should still work well. Glad to hear they are so helpful too. In looking to buy another bottle I’ve found this article. What I did to preserve the product’s use was to distribute it into a few small dropper bottles and store the ones not in use in the refrigerator. I had these available at my work. Worked a treat! The last bottle only oxidised as I dragged out it’s use towards the end. Kim, what a clever trick! Thanks for sharing. Have you tried Cosmetic Skin Solutions C+E? I heard that’s another dupe for Skinceuticals CE Ferulic and virtually identical in terms of ingredients. My concern with using the timeless is the alcohol. It is benzylalcohol(pardon the spelling don’t have it in front of me) This from what I have read is a “bad” alcohol. I started using the cosmetic skin solutions and I wrote the company and they replied that they also use alcohol in their c,e ferulic serum. and their 20% c serum. Their ingredients are identical to skinceuticals. Lina, where did you hear it’s bad? In very high concentrations, yes, but then too much of something is almost always bad. But, in the amounts used in cosmetics, it doesn’t cause any problems (unless you have super sensitive skin, of course). I just wanted to add that I was told the alcohol is used to deliver the vit c deep into the skin, however I would like to know if this is at the cost of damaging your skin. Any thoughts would be appreciated. Thank you. Lina, that would depend on several factors, including what other ingredients are included in the formula. If the product is well-formulated, then it’ll contain antioxidants, anti-irritants, and cell-communicating ingredients that’ll balance out any potential side effects the harsher ingredients may cause so as not to damage skin. Lina, my pleasure. Glad to be of help. Definitely leave it on, you will see much better results. No, phenoxyethanol looks and sounds like an alcohol, but it isn’t. Propylene glycol, which is a penetration enhancer, is in the alcohol family. I remember reading somewhere that the ph of css is slightly higher than skinceuticals. I think timeless has the most similar ph, so that would be the best dupe. Michelle, yes, it will. It has the same ingredients, so it performs pretty much the same. Shilpi, it’s not dangerous, but, the more yellow it becomes, the less effective it gets. So, if you keep using it, don’t expect the same results. Skinceuticals def has a great product, but they should be arrested for GREED! The price has increased over 300% since its beginning NOT that many years ago. So – Timeless would be a good product to use after micro needling? Thanks for such great information! I just discovered your website and have already read several super informative articles. Question: I have a lot of sun damage, hormonal acne and fine lines/wrinkles and am currently using retinol (this one from Amazon is great: https://www.amazon.com/gp/product/B00RSMM362/ref=oh_aui_detailpage_o04_s00?ie=UTF8&psc=1) I’ve also read a ton of good things about using CE Ferulic. Can you use both and if so, in what order? Renee, you’re welcome. I’m glad you’re finding my blog useful. Yes, you can absolutely use both. If you have lots of sun damage, this combination (retinol + CE ferulic) will give you even better results. But, it could also be harsh at first, as both retinol and vitamin c are very powerful. I’d recommend you start using the products on alternate days at first, and then CE ferulic in the morning (together with sunscreen) and retinol at night. Hope this helps. Is their a dupe product for Skinceiticals Phorectic serum ..?? SC price is outrageous. But I have frequent breakouts so I can’t use timeless ferulic acid. Ann, the only one I know of is Cosmetic Skin Solutions Phloretin serum. They make a lot of SC dupes and the prices are more reasonable too. Have you tried the Candid Essentials vit c serum? Is it comparable to SkinCeuticals or is Timeless better? Thank you!!! Heather, I haven’t personally tried it, but judging from the ingredients it is a good serum. The main difference is the form of vitamin C used. Both Timeless and Skinceuticals use pure vitamin C, while Candid Essentials a derivative, sodium ascorbyl phosphate. That’s more gentle but may be less effective. Frankly, there’s not much research about this particular form of vitamin C and its effects on wrinkles. That’s why I’d rather stick to Timeless or Skinceuticals. How would the Timeless do with acne prone skin? Thank you so much for all of information you have on your blog!!! Brittany, it works well for acne prone skin too. There’s nothing there that would bother it. Unless your skin is too sensitive to tolerate such a high concentration of vitamin C, but if you start using it gradually you shouldn’t have any problems with it. Hello Gio, I’ve been reading your blog for the first time this past week, very informative. I recently heard about the Skinceuticles product but of course the price put me off. I decided to purchase the Timeless product. I think I’ll test it out before I put it on my face to make sure I don’t have a reaction. I’ve never used anything this strong on my face. Sachiko, so glad you’ve found it useful. The Timeless serum is a great choice but it’s a bit strong than the Skinceuticals one so a patch test is a great idea. You can also start using it two or three times a week and build up frequency gradually. I’ve been using Timeless C and E Ferulic (bought on Amazon) for over a year now, and I think it works great. I have always had large pores, and they used to turn dark on the nose and chin area, despite daily cleansing, using Clarisonic, toners, etc. Now that I’m on my 2nd year of Timeless C E Ferulic, I am pretty convinced that it has made the difference — my pores stay much “cleaner” looking. I also use Retin-A about twice a week. Other than that, I don’t do much. I use Cerave moisturizer before makeup. I also use a simple oil (currently macadamia oil, but have also use jojoba oil) at night. The C E Ferulic and Retin-A are the products I would buy repeatedly. I’ve never used Skinceuticals, so I can’t comment on how it compares to Timeless brand., except to say that Timeless is a lot less expensive. I’m pretty much sold on the Timeless serum but I have read on their website that they don’t recommend it for oily skin as it contains Vit E. I did a little research and apparently vit E clogs pores? Please tell me it’s not true!! 🙂 I also use Pai’s rosehip oil in my routine which contains vit E and works wonders. I really like it and will continue to use it but I just realise it might be giving me some blackheads on my chin! I’m getting more lately and didn’t know why it was but that could be it. Could exfoliating more help? Or avoiding the chin area? I don’t seem to have blackheads anywhere else. Trin, pure vitamin E has a comedogenicity rating of 2, which is moderate. But comedogenicity ratings aren’t 100% reliable so it’s difficult to tell. A lot of people say that isopropyl palmitate, for example, is not comedogenic yet it ALWAYS breaks me out like crazy. In the end, it’s all about listening to your skin and monitoring the way it’s reacting. But yes, exfoliation will help to keep your skin blemish-free. Make sure you use salicylic acid as that’s the only thing that can get inside the pores and remove the blackheads. Love your blog! So useful! So, a quick question; I have been using Skinceuticals C E Ferulic for 2-3 months now, I love it. So, would you recommend the Timeless dupe or the Cosmetic Skin Solutions dupe? Louise, that depends. The CSS dupe has the same amount of vitamin C as the Skinceuticals, so your skin shouldn’t have any problems with it. The Timeless serum has a higher concentration. If your skin is sensitive, I’d stick to CSS. If it’s pretty resistant and you’d like the extra boost of vitamin C, Timeless is a good option too. I very much appreciate the aim and the information on this blog but the Timeless serum did absolutely nothing for my skin. I used it as directed, kept it in the fridge and zero results. Very disappointing and I can’t understand all the raves about this product. Thanks. Caroline, sorry the Timless serum didn’t work for you. This combination is preventative. It can prevent wrinkles from appearing too soon but it won’t do anything for the wrinkles you already have. But you should still have seen some improvements like a smoother texture and brighter skin tone. Did you try other serums with this combo? It’s 2017 and Skinceuticals is now $165 dollars, haha. Hey thank you so much for this great read, very informative. I have been on the hunt for a great vitamin C and heard about SkinCeauticals but my god the price is OUTRAGEOUS. Therefore, I am glad you found this Timeless dupe! I am just wondering, is there a great vitamin c with a lower % concentration than 20% so that I can start with and work my way up? I heard that 20% can be harsh for first timers so I am trying to find a great similar serum with less % for now. Jenny, yes, you’ve ready right. 20% Vitamin C can be very harsh on the skin if you’ve never used it before. I’d start with something like Paula’s Choice Resist Super Antioxidant Concentrate Serum because it uses a derivative of Vitamin C that’s gentler on the skin. Plus, it also has ferulic acid and vitamin E.
Hello there!! I’ve been finding this read very interesting. I just wanted to know whether any of these products mentioned reverse skin damage i.e loose skin? I am 27 years old and I have been using Skinceuticals serum 10 but I feel like my skin is not really benefiting from it. I do have a facial regime with it however I wasn’t too sure whether to try out using the CE Ferulic since I’ve been using Serum 10 for almost a year now. What do you suggest? 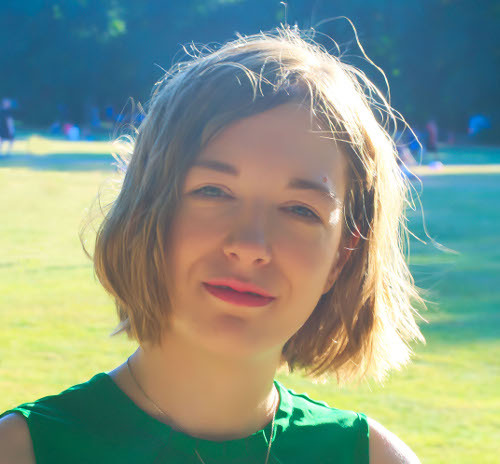 It may sound ridiculous that I am concerned about loose skin at this age however my skin has gone through a lot of changes since I had a bell palsy last year and I’d like to improve the damage that was made due to stress. Hi, I’ve noticed that You have written another blog about Paula’s choice c15 is a good dupe for c e ferulic. Which is best do you believe? Timeles or PC C15? Thanks! Sarah, it depends on what your skin can tolerate. Timeless contains a slightly higher dose than Paula’s Choice and Skinceuticals. If your skin is well used to them and not too sensitive, it may be worth it to upgrade to Timeless. I am so glad I found your site, after reading many articles on your blog its safe to say I trust your reviews and advice MORE than the people who are “marketing” this stuff out to us. I have combination skin with some light rolling scars on my cheeks and I have been agonizing over putting together a decent skincare regime for myself and am dying for some advice. I have been kinda “obsessive” with trying to put together a regimen that includes ALL the superstar ingredients- but I know that can be hard to do with out going “overboard” with many products and there has been confusion on how well it will work because I know ingredients in a moisturizer will work differently than if they were in a serum. So i have really been wanting to have a serum with the magic 3- ferulic-vit c and e but skinceuticals is way too expensive so I had TIMELESS on my radar to try. If I had that as my serum and used Drunk Elephants new Protini Polypeptide moisturizer ( its so lovely!) and used The Ordinary Granactive Retinoid 2% Emulsion at night- would that be enough? Would using Timeless be enough antioxidants for me? Should I incorporate a hyaluronic acid serum? peptides via Protini moisturizer enough? ( I use mandelic acid peels from Makeup Artists choice 2x a month and use Pixi glow peel pads with 20% gycolic acid as my weekly exfoliation /maintence) What do you think? THANK YOU! Rorie, I say listen to your skin, not marketing claims or skincare hype you see online. Does your skin need a hyaluronic acid serum? I use one in winter when my skin gets drier and needs the extra hydrating help. In the summer, I do without. My advice is to stick to Protini for now and if you find that still leaves your skin feeling tight and dry, then you can add a hyaluronic acid serum to the mix. Just purchased the Timeless Vitamin C.
Tried the Ordinary and did not like the feel at all, too gritty, even when mixed with other product as recommended. Had a sample of Kiehl’s Powerful-Strength Line-Reducing Concentrate and loved it but not the price. Hoping the Timeless works well with my other recent Paula’s Choice precuts. Cindy, I hear ya. The Ordinary products are effective but they compromise on texture. The Timeless Vitamin C is one of my faves. I’m sure you’ll love it too. Gio, have heard of or tried Maelove’s Glow Maker? I’m not a fan of the fragrance but, as a vitamin C serum, it should work well. I’ve been reading all your comments and they are extremely useful I’m only 25 but have made mistakes in the past of tanning my face and am starting to see the repercussions. I have been trying to decide between the skinceuticals and cosmetic skin solutions C E FERULIC serums but have also seen other people combine the skinceuticals Ha intensifier, Discolouration defence, Phloretin cf and I’m curious on what the combination of those products will do for your skin would you recommend purchasing all three or just the c e ferulic serum? Claudia, I recommend introducing one skincare product into your routine at a time otherwise you won’t know what really works and what doesn’t. Start with CSS CE Ferulic or Skinceuticals CE Ferulic and see how your skin reacts before deciding if you need something else. Hello! First of all I love your blog. Thanks! How does Timeless Skin Care – 20% Vitamin C + E Ferulic Acid Serum 1 oz compare to Paula’s choice C15 Super Booster? I have been using Paula’s choice for the last 6 months and I like it but thinking of trying a different option for comparison? Is this worth doing? If not Timeless, which other vitamin C serum or booster would you recommend? Thank you in advance! Helena, thank you for your support. Timeless has a slightly higher concentration of vitamin C than Paula’s Choice (20 vs 15). That makes it a little more effective but also a little more irritating. If you find your skin tolerates Paula’s Choice C15 Booster well, it may be worth upgrading to Timeless. Hi Gio, have you tried Bombshell Bathtime’s Vitamin C E Ferulic Acid serum? It’s about $25 and is pretty similar to SkinCeuticals Vitamin C E Ferulic, with 17% L-Ascorbic Acid and 0.5% Ferulic Acid with a 2.6-2.9 pH. You’ll notice that the ingredients list looks better and it smells better, but without any added fragrance because of the rosewater base. Olivia, no, I haven’t yet but glad to know there’s another dupe around. Well done! does it goes with retin A creams like retancnyl ? could I replace it with the same benefits ? Dominique, I love Paris, such a beautiful city. You’re so lucky to live there! A vitamin C serum with vitamin E and ferulic acid is great at preventing wrinkles but it can’t treat the ones you don’t have. That’s why it’s not a substitute for any forms of vitamin A. If your sensitive skin can tolerate it, use vitamin C in the morning and vitamin A at night. If not, stick to vitamin A. It provides the most anti aging benefits. Hello! As usual, your information and advise is “spot-on”. Thanks so much. I have 2 dupes that I really love. I wasn’t a fan of Timeless. Mine are Maelove Glow Serum and Shero Science C/E/ferulic serum. Love them both! Great tip, Gio. Thanks! I was gonna try one of The Ordinary’s Vitamin C Serums, but now I want to try this dupe instead. I just don’t like to buy any skincare from Amazon since they regularly sell knock offs. Hopefully it is carried at a more reputable dealer. Geo, I hear ya! I stopped linking to Amazing reading so many horror stories. I think you can buy Timeless on their website.